Each individually-decorated guest room in Oscar Wilde’s last home are equipped with a minibar and an iPod docking station. All of the air-conditioned rooms have a seating area and a dressing room. Free internet access is available. Le Restaurant has 1 Michelin star and serves seasonal French cuisine. Guests can enjoy drinks in the bar at L'hotel. A continental breakfast is served every morning. The Louvre Museum is 700 metres from L'hotel, while Orsay Museum and Notre Dame Cathedral are a 15-minute walk from the property. Pont Neuf Metro Station is a 10-minute walk away, providing access to the Opéra Garnier. 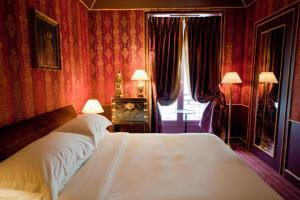 This room has a view of the rue des Beaux-Arts. Extra beds are not available in this room. 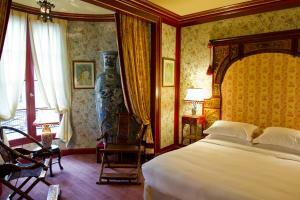 Rate: € 350.00 ... € 820.00; select dates below to get current rates. This room has a view of the interior courtyard and the restaurant's glass roof. Extra beds are not available in this room. This suite features a separate living room and has a view of the rue des Beaux-Arts. An extra bed is available upon prior reservation. This double room has air conditioning, seating area and CD player. Extra beds are not available in this room.